"Creep" is the term for when holiday items start appearing in stores earlier and earlier every year. You may have heard The News decry "Christmas Creep". Every year, they position it as a bad thing. For some reason, we're not supposed to get excited for a holiday until a certain, pre-agreed upon time. Personally, I can't wait for the holidays. The sooner I can look at holiday-themed garbage the better! Bring it on! Ok, ok, it IS a bit ridiculous when I go to my local Lowe's in early November to buy some new bulbs for our X-Mas tree and find that the entire X-Mas section is wiped out and there are now grills in their place ... but it's a small price to pay for jump-starting the holidays. So, I was thrilled this weekend (August 6) when my beautiful wife and I went into Eckerd's (a pharmacy-like store that sells everything, in case you don't have them near you) and there, at the very back of the store, on the very top-most shelf, was Halloween Creep! I did not buy these pumpkins. I would not buy these pumpkins. But I am sure glad these pumpkins exist. 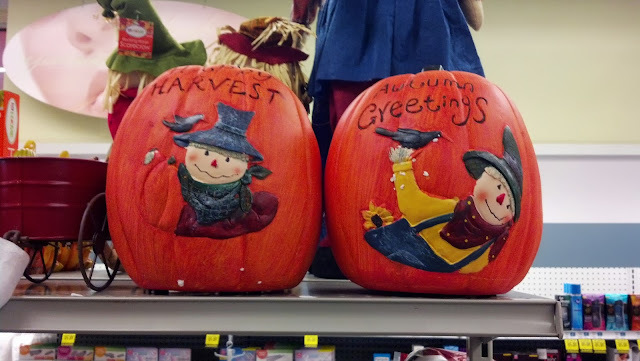 "Happy Harvest" and "Autumn Greetings" sounds like a watered down version of "Happy Halloween". 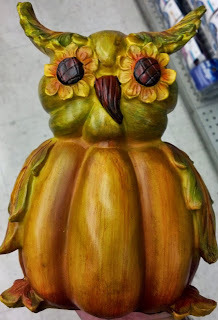 You would buy these plastic pumpkins as a gift for someone who you were not 100% sure celebrated Halloween, I guess? My beautiful wife pointed out how it's even a physical creep, this year, too. The front of the store was still very much dominated by Back To School items and these few Halloween items were at the very back. Over time, those items will spread, literally creeping towards the front of the store and prominence, displacing the Back To School erasers and locker mirrors. I'd like to set up a camera on a timer to catch this slow spread, but there are probably laws against that sort of thing. Is this the year I hang up a "harvest wreath"? Probably not, but I have to make that decision pretty soon, or all of them are going to be sold out by the time I make up my mind. Down-side: I'll have to find some place to put it for the next two months ... and then for another 10 months after December. My apartment is small and we already give up enough space to holiday decorations. My choices must be wise. And, YESSSSSS! That is Brach's Autumn Mix! The best candy corn on the market comes from Brach's. 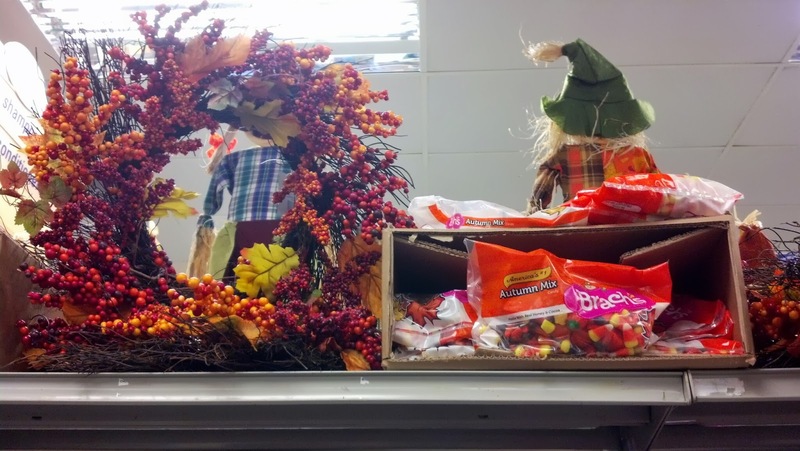 And their Autumn Mix is for that very narrow segment of the population who cannot decide if they want candy corn, "indian" corn, or Mellowcreme pumpkins. I know that so many people say they don't like candy corn, but a lot of people also think the world was created 6,000 years ago. What I'm getting at is that there are a lot of stupid people in this world. Also: More candy corn for me. PLASTIC GOURD DUCK! 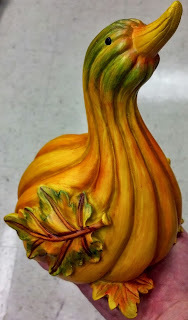 Why buy a real gourd and decorate it, when real gourds will just rot and start to smell weird? Buy a plastic gourd duck and save yourself the hassle. Every gourd-related hassle. Good lord. Good GOURD! It's an abomination! I can't conceive of who (outside of myself, just a bit) would buy this. But I know that it'll be gone, by the next time I go back to Eckerd's. It'll be someone's favorite decoration, ever. Better still, once the buyer dies, their kids will try and sell it at a stoop sale (NO! We have not had ours yet. PLEASE stop asking!) It won't sell, so they'll eventually just throw it out. It's made of plastic and so will never biodegrade in the landfill. Future generations will uncover this and think it's an idol of something that we worshiped it like a god. Gourd Owl God created the earth 6,000 years ago. Teaser: Along with Brach's, they also had a couple of other new, novelty candy corns. I'll review those in a later post. So look forward to THAT! Copyright Sommerjam 2016. Simple theme. Powered by Blogger.